Twinkle twinkle: Children's science book. Maybe just don’t read this to kids as a bedtime story. 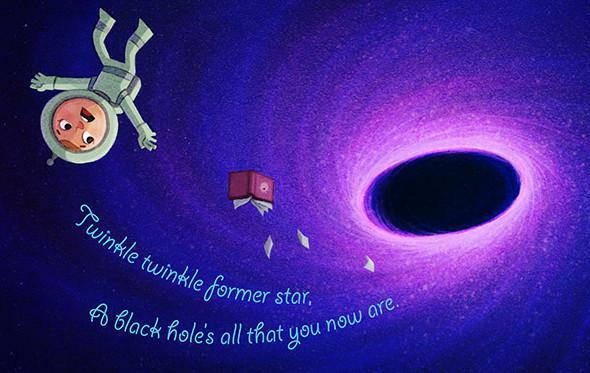 This is so fun: my friends Zach Weinersmith of SMBC and Henry Reich from Minute Physics have written an astronomically corrected version of the song “Twinkle Twinkle Little Star” for kids! They have all kinds of e-versions available, and you can pre-order a physical copy, too. The drawings are by children’s book illustrator Chris Jones, so this really is top-notch stuff. When I first saw it I thought I saw a mistake in it, but I was wrong. I point it out so others don’t misunderstand it the way I did. The lyric is about a pulsar: “Out away from Earth your drift, this is known from your redshift.” I mistook this line to say we know its distance from its redshift, but that only works for very distant galaxies, not pulsars, which are inside our own galaxy. But I misunderstood; they’re saying we know it’s moving away from Earth by its redshift, and that’s technically correct. So there. Anyway, this has come out just in time for the holidays. Go buy it, and turn more kids into little science pedants!